In the past 18 months or so, my photographs have been used in an exhibition organised by Lichfield Discovered and the Lichfield Waterworks Trust in Saint Mary’s Church, Lichfield, as part of the programme for Lichfield Heritage Weekend, in a new book edited by Professor Salvador Ryan of Maynooth, in the Advent 2014 Catalogue from DM Hay, for a fund-raising campaign by Jesus College Boat Club in Cambridge, for a series of evening events in Grosvenor Road Baptist Church, for a quiz on the Late, Late Show, and on the weather forecast on BBC Midlands. A new academic year means a new Handbook is produced for the staff and students at the Church of Ireland Theological Institute, and three of my photographs illustrate the front cover of the new handbook for the academic year 2014-2015 which began this week. During the summer, the chapel has been repainted and redecorated. 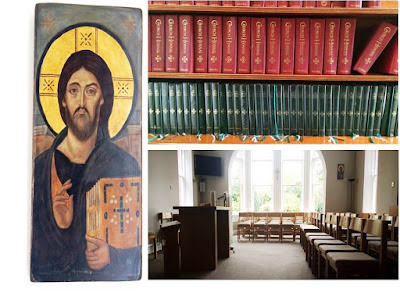 The chapel and our liturgical and worship life are at the heart of community life in the institute, so this seems to be an appropriate photograph at the top of the cover. The third photograph on the front cover shows the bright, colourful courtyard garden beside the dining room. The plants and the colours are a reminder of how bright spring and summer can be at CITI.